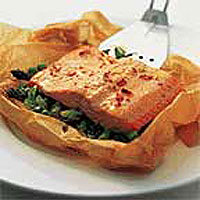 Cooking fish in baking parchment locks in all the flavour and keeps it succulent. Use Lurpak Butter with Lime & Chilli to add a gentle kick without overpowering the subtle flavours of the fish. Look out for Lurpak with Crushed Garlic, too. Preheat the oven to 200ºC, gas mark 6. Cut 2 x 35cm squares of baking parchment, then spread a little lime and chilli butter over the centre of each square. Pile the asparagus tips and peas into the centre of each sheet, then scatter the salad onions over. Slice the butter and place a couple of slices onto each pile of vegetables. Season and place the fish on top. Arrange the remaining butter on the fish and sprinkle with the wine or cold water. Draw 2 opposite sides of the paper over the fish and fold over twice. Tuck the ends of the paper under the parcel to seal everything in. Place the parcels on a baking sheet and bake for 20 minutes. When cooked, leave to cool for 2 minutes, then open carefully and slide the contents onto warm plates. Serve with cooked baby new potatoes. Somerset Butter with Crushed Garlic can be used in a variety of ways. Spread it over hot granary toast before topping with mushrooms sautéed in a generous knob of the butter. Push a little between the flesh and skin of chicken breasts before roasting. Toss in lightly cooked summer vegetables such as green beans, sugar snap peas, courgettes or new potatoes.